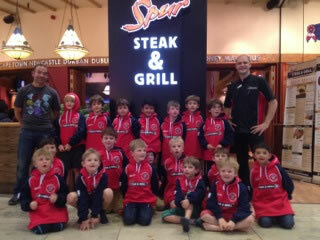 To kick off the sponsorship, members of the team came down to Spur on 24 October to try out their new Spur hoodies and to meet restaurant manager Wayne Patterson and his team and to tuck into Spur’s legendary ribs, burgers and milk shakes. Some of the parents couldn’t resist and tucked in too. As part of the sponsorship deal, Spur is contributing to the cost of the new team hoodies, tents, equipment and tour jerseys and has also promised to help raise funds at various team events. The first of these will be the Spur tournament on 9 November at Rosslyn Park, when the U7s take on 10 clubs, fielding a minimum of two squads from around the country to play on the 1st XV field. Spur will be firing up a big barbecue throughout the day’s tournament and donating profits to the team.